Top ＞ What is Mamehon-Gachapon? Mamehon means miniature book in Japanese. Gachapon is a kid’s machine like a gumball machine. When you put one coin and turn the knob, one capsule come out. Inside the capsule, a toy is in. There are many kinds of toys in the capsules. You can’t choose, but the machine chooses the one and put out. We enjoy it like a fortune cookie. Or you can try again if you have more coins. 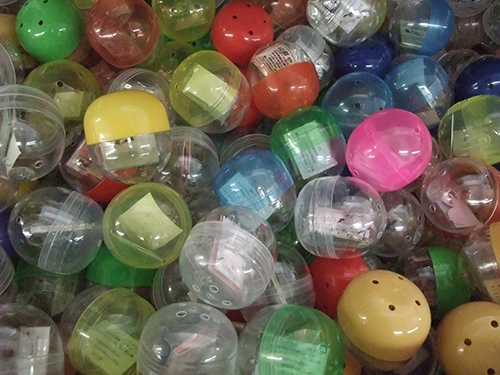 In Japan, Gachapon is popular amusement for kids and teenager. For adults, it is a nostalgic thing. We put miniature books in capsules 10 years. We went to 12 places in Tokyo, Atsugi and Kyoto. We got 2 independent branches in Fukuoka and Hong Kong. We, Mamehon -Gachapon Tokyo sold 18300 copies in capsules. 23 artists joined the project. 20 media picked up us. Always the capsules were sold out. 1 capsule is 100 Japanese yen. In 2006, I started making miniature books, but few people knew miniature books. 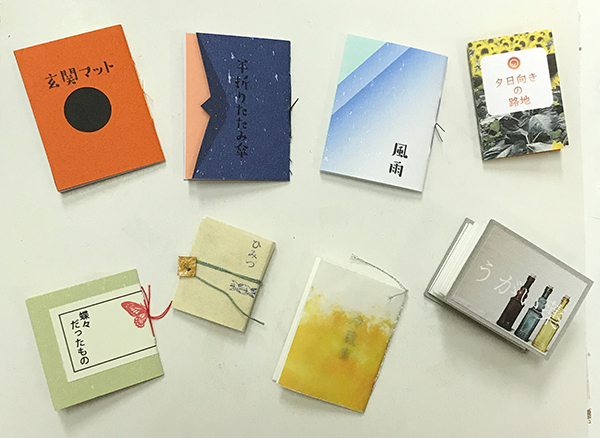 When I organized a group exhibition of miniature books, I thought that it is necessary for people to be interested in miniature books. And I wanted to let them bring miniature books to their home. At that time, one of my friends had a Gachapon machine that he did not use. I got an idea to put miniature books in the Gachapon machine. 7 artists joined the group exhibition. We put small arts in the capsules and the machine made us meet our customers. We earned more income than selling postcards. NHK TV, Japan’s largest broadcasting picked up the miniature book exhibition and Mamehon-Gachapon in the news. It was extremely popular sold out every day. After the exhibition, we went out the gallery and went to the cafés, bars and bookstores. 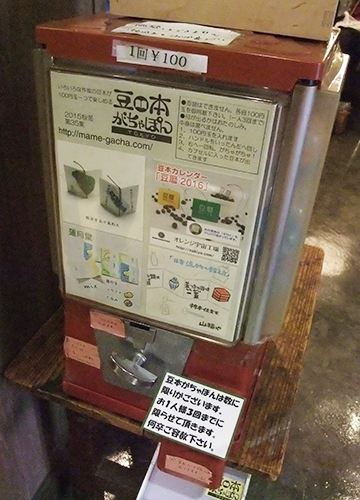 A customer loved the Mamehon-Gachapon and asked that she wanted to do the same in her town. So we got the Fukuoka branch. Similarly, Hong Kong Eggwich was established. Miniature books were spread in capsules. 1 miniature book is 100 Japanese yen, about 1 US dollar. Is it crazy to sell handmade artist’s book as 100 yen? It is for publicity, it is like a gift from the artists. Not every artist can make it. We don’t want to disappoint customers, we do quality examination when we get new request to join. Only 23 artists could join the Mamehon-Gachapon Tokyo. Core members are 4 artists. At one time, we make 100 miniature books. We get together to mix the capsules and set the machine. After that, we have some tea and talk. One artist says that 10000 yen and tea with friends is sufficient reward. Another artist says that she likes the view of 100 capsules filled with her miniature book. Another artist says that she is pleased to be able to make people smile at 100 yen with her miniature book. For me, it’s interesting challenge to make in under many limitations. It must be 100 yen, it must be within the capsule size and it must be made 100 copies until the meeting date. We want to continue making them. Thus we have been thinking about working processes and materials. That led us to improve bookbinding and design skill. For book stores, Mamehon-Gachapon is a special thing to gather people. This project is still going on. You can try to Gachapon in Tokyo and Atsugi. And, in 2018, international Gachapon is organized by Tiana Wong, Hong Kong. Artists from Hong Kong, Taiwan, Shanghai and Japan mix capsules. The exhibition is start at “House by Kubrick”, Hong Kong, from 1st of September to 30th. Copyright © Mamehon-Gachapon All rights reserved.